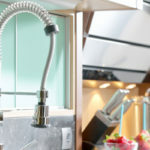 There are certain materials that add a ‘wow’ factor to your kitchen remodel, and there are other materials that only push your remodeling budget over the edge. 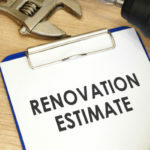 Here are 3 overpriced materials to avoid so that your kitchen remodel doesn’t go over budget. Marble countertops are popular in high-end kitchens, causing many to desire the luxurious look. Yet, if your kitchen remodel is on any sort of budget you may want to reconsider installing marble countertops. Marble is undeniably beautiful and has a lot of the same coveted qualities of granite, but overall it is not as durable. Since marble is more porous than granite it tends to stain easier from common foods and beverages. Plus, marble is softer than granite, meaning it will incur scratches and dents easier. If you really want marble countertops there are some alternatives. Lighter colored granite often imitates the look of marble while maintaining better durability. 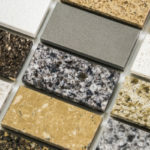 Tops Kitchen Cabinet offers high quality granite countertops in an assortment of color options. The best part is that our wholesale prices go easy on any budget. If you do add real marble to parts of your kitchen, it is recommended to do so in areas that don’t get as much use. This helps you cut down on overall surface space and it also prevents a mass of marble from becoming dinged up, stained and damaged faster than you can say—we need new countertops! Real hardwood floors are gorgeous, long lasting and incredibly durable but that doesn’t mean they fit in with your kitchen remodel budget. The options for authentic hardwood flooring are practically limitless, with some wood varieties costing way more than others. Do your research in order to find a wood floor that aligns with your budget. If that becomes an impossible task there are other flooring options that give the same look without breaking the bank. Natural bamboo is eco-friendly, sustainable and offers the natural look of wood without the high price tag. Since bamboo grows much faster than trees, it is a greener renewable resource, hence why it costs less. Laminate comes in a plethora of styles and colors, many of which imitate the appearance of wood. Vinyl planks that imitate the look of wood make an affordable and attractive option for your kitchen remodel. Cork flooring is eco-friendly, affordable and on trend. It offers a bit of texture and color to your kitchen. The best part is that cork is resistant to so many things including mold and insects. Plus, it is resistant to sounds making your home quieter no matter who is stomping around in the kitchen. Paint plywood. Most homes have a plywood subfloor with additional flooring materials added on top. Instead of adding more wood, you could always paint the subflooring so that it appears presentable. This tactic has been used since the 1700s. Just don’t forget to apply (and consistently reapply) a water sealant as necessary. One of the main reasons flooring is applied on top of subflooring is because it is not water resistant. Kitchen cabinets are made of many different materials; from hickory and oak wood to stainless steel clad cabinetry. 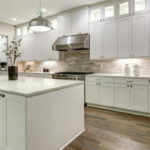 The most expensive cabinets you can install are stainless steel clad cabinets, while the cheapest are a thin plastic laminate surface known as melamine. The type of wood and cabinetry detailing play a huge role in overall price. For instance, cherry wood is generally around 7-10% more expensive than oak wood. Oak, pine and hickory wood tend to run very similar in pricing. If you decide to paint your new kitchen cabinets expect to pay around 10-15% more than if you go with a standard finish. The most important thing is to invest in high quality wood cabinets that will surpass the test of time. All fancy detailing comes second after that. Too much detailing could break the bank and cause you to fall out of love with your kitchen as soon as the next trend comes around. Also, highly detailed and personalized kitchens make for a harder resell, meaning some of the priciest cabinets on the market will likely never pay off. Add pretty hardware to cabinets in order to give them stand out style without spending an arm and a leg. These details are easy to change out as well, preventing scaring off future homebuyers. Save money on your kitchen remodel by visiting Tops Kitchen Cabinet today! 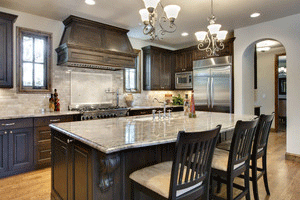 We offer kitchen countertops, cabinets and more at affordable wholesale prices.